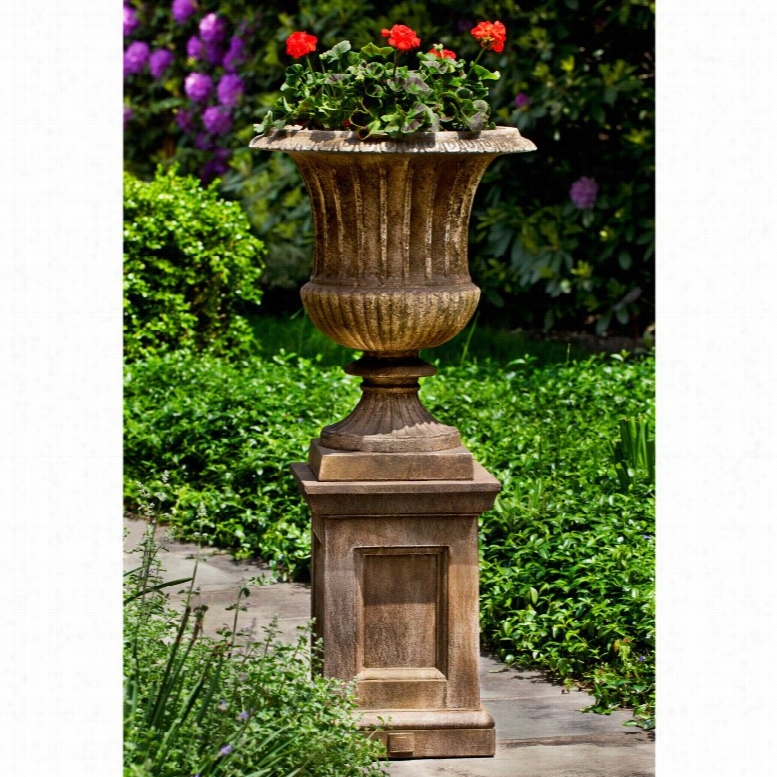 Campania International Smithsonian Classical Urn Planter with Barnett Pedestal. Dimensions: 22.5 diam. x 48.5H in.. Cast stone, glass fiber reinforced concrete. Choose from available aged finish options. Tall urn with fluted detailing. Pedestal base with recessed panels. Generous planting depth. 15-step construction process. For classic or contemporary outdoor settings. Recreate a masterpiece by adding the Campania International Smithsonian Classical Urn Planter with Barnett Pedestal to your landscape design. This set is made of lightweight and durable cast stone that comes in a variety of aged finish options. Season after season this graceful urn and its classic pedestal base will bring joy to your landscape design. Campania Cast Stone: The ProcessThe creation of Campania's cast stone pieces begins and ends by hand. From the creation of an original design, making of a mold, pouring the cast stone, application of the patina to the final packing of an order, the process is both technical and artistic. As many as 30 pairs of hands are involved in the creation of each Campania piece in a labor intensive 15 step process.The process begins either with the creation of an original copyrighted design by Campania's artisans or an antique original. Antique originals will often require some restoration work, which is also done in-house by expert craftsmen. Campania's mold making department will then begin a multi-step process to create a production mold which will properly replicate the detail and texture of the original piece. Depending on its size and complexity, a mold can take as long as three months to complete. Campania creates in excess of 700 molds per year.After a mold is completed, it is moved to the production area where a team individually hand pours the Liquid cast stone mixture into the mold and employs special techniques to remove air bubbles. Campania carefully monitors the PSI of every piece. PSI (pounds per square inch) measures the strength of every piece to ensure durability. The PSI of Campania pieces is currently engineered at approximately 7500 for optimum strength. Each piece is air-dried and then de-molded by hand. After an internal quality check, pieces are sent to a finishing department where seams are ground and any air holes caused by the pouring process are filled and smoothed. Pieces are then placed on a pallet for stocking in the warehouse.All Campania pieces are produced and stocked in natural cast stone. When a customer's order is placed, pieces are pulled and unless a piece is requested in natural cast stone, it is finished in a unique patinas. All patinas are applied by hand in a multi-step process; some patinas require three separate color applications. A finisher's skill in applying the patina and wiping away any excess to highlight detail requires not only technical skill, but also true artistic sensibility. Every Campania piece becomes a unique and original work of garden art as a result.After the patina is dry, the piece is then quality inspected. Telescope Casual 36 in. 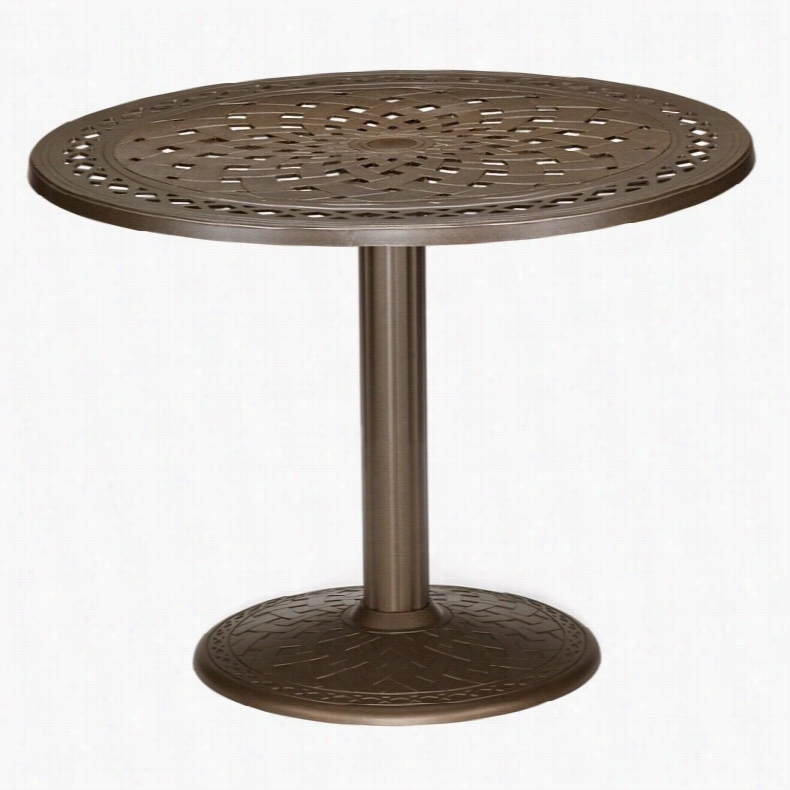 Round Cast Top Pedestal Balcony Height Patio Dining Table. Dimensions: 36W x 36D x 36H in.. Long-lasting cast-aluminum construction. Choose from the available finish options. Round top with decorative pattern. Integrated umbrella pedestal base. The Telescope Casual 36 in. Round Cast Top Pedestal Balcony Height Dining Table is ideal for savoring food and drink-and sharing time with friends and family out in the open air. This inviting outdoor centerpiece features a decorative top and perfectly stable pedestal base with an integrated umbrella holder for added value. Built to last, its elegant design is expertly crafted from 100% maintenance-free aluminum that will never rust, and it comes in a wide variety of exciting powder-coat finish options that won't crack or peel.Our product specialists have been individually trained by the Telescope Casual furniture company and know their product front to back, top to bottom. The most popular fabric, finish and seating configurations are shown here, but if you don't see one that speaks to you, a product specialist will help you create the perfect set. They can also help you design a custom seating arrangement for your outdoor living space. Call 866-579-5183 to speak with a product specialist. Hours: Monday-Friday 8 a.m.-7 p.m., Saturday 9 a.m.-5:30 p.m. EST.About Telescope Casual FurnitureAfter 100 years in an industry where design differentiation is crucial for success, Telescope Casual Furniture has become known for its ability to stand out. The century-old manufacturer exceeds most retailers' expectations not only by consistently turning out unique products, but also by maintaining an unwavering stance with respect to quality. Recipient of the Casual Furniture Retailers Association Manufacturer Leadership Award, the Granville, N.Y.-based company will continue to push the envelope on already high standards for the next 100 years. Color: Textured Silver. 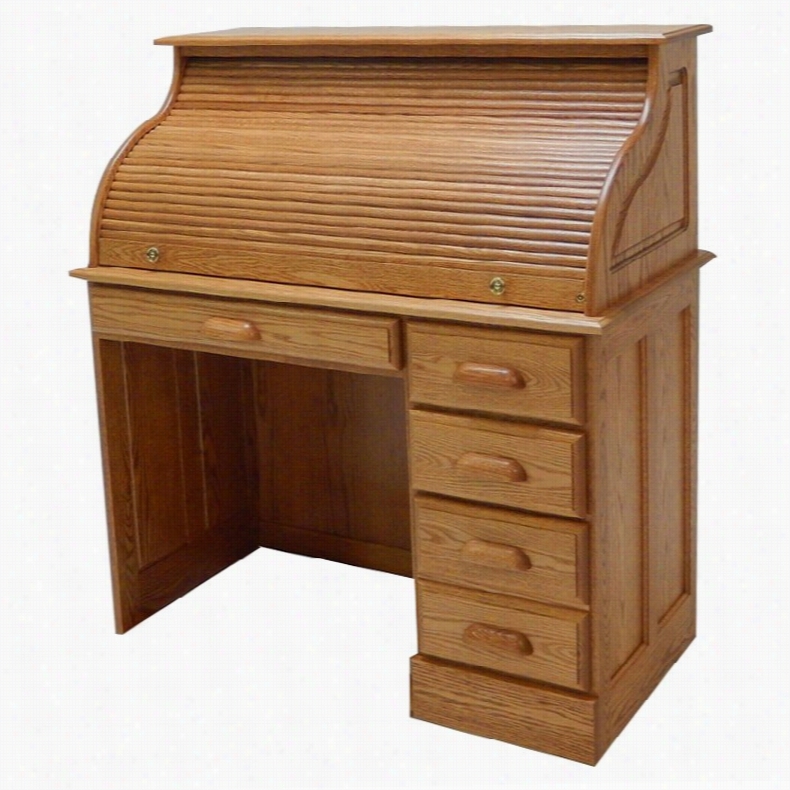 Haugen Customizable Deluxe Roll-Top Double Pedestal Desk. Measures 48W x 22.25D x 47.5H in.Beautiful and classic designAvailable in a variety of stain and wood options7 drawers including 2 file drawersLacquered drawer boxesPrecision ball-bearing guides8 pigeon holes in varying sizes. With its classic elegance and Beauty the Haugen Customizable Deluxe Roll-Top Double Pedestal Desk looks beautiful in any room. Available in your choice of wood and stain combination you&rsquo;ll love the versatility and classic beauty this roll top desk offers. Seven drawers including two file drawers provides ample storage space while the precision ball-bearing guides and lacquered drawer boxes are not only made to last but make opening and closing the drawers smooth and easy. Eight pigeon holes in varying sizes gives you plenty of space for storing papers and other assorted items to help keep you organized. 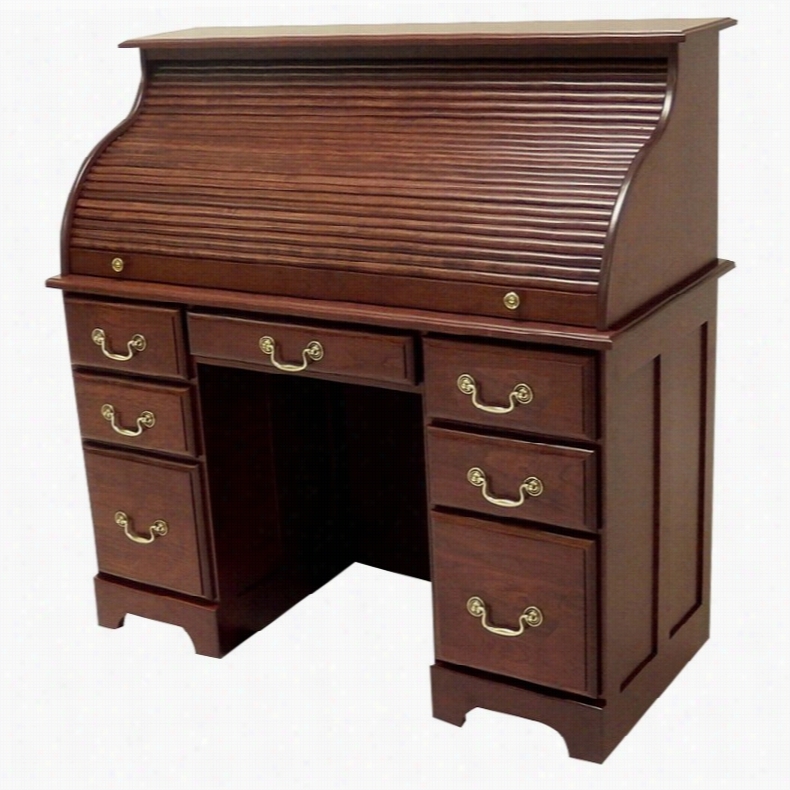 A gorgeous addition to your home this sophisticated and elegant roll top desk will complement almost any decor. Wood Types: Cherry: A fine textured hardwood with a prominent figure and a beautiful warm pink color. Cherry may have occasional natural features such as pecks small pitch pockets and mineral streaks; all of which contribute to the uniqueness of this species. Cherry ages gracefull acquiring a rich patina that continues to darken over time further enhancing its beauty and warmth. Maple: A strong fine textured hardwood which has a subtle grain figure. The color tends to be a light creamy tan. Maple is known as one of the heavier and denser woods available and is very sturdy. It has some naturally-occurring features such as an occasional mineral streak to the more spectacular birds-eye burl fiddleback or quilting. Quartersawn White Oak: Heartwood is a light brown; some boards may have a pinkish tint or a slight grayish cast. Sapwood is white to cream. The grain of this hardwood is open with longer rays than red oak. Figuring due to pronounced rays interlocked and wavy grain are brought out more conspicuously than red oak. Walnut: A highly desirable finely grained hardwood with dark tan to brown heartwood and creamy white sapwood. Walnut generally has fairly straight grain but produces more types of figures than any other wood. It darkens with age and exposure to light though more slow than cherry. Red Oak: Heartwood is a light to medium brown commonly with a reddish cast. Nearly white to light brown sapwood is not always sharply demarcated from the heartwood. The grain is straight with coarse uneven texture. Haugen Home Furnishings Established in Hutchinson Minn. in 1991 Haugen Home Furnishings prides itself on producing premium-quality furniture using only the best solid wood products available. Haugen uses a seven-step finishing process and a superior hand-rubbed lacquer finish and all of the company's furniture is handcrafted in the USA. Color: Caramel. Telescope Casual 36 in. 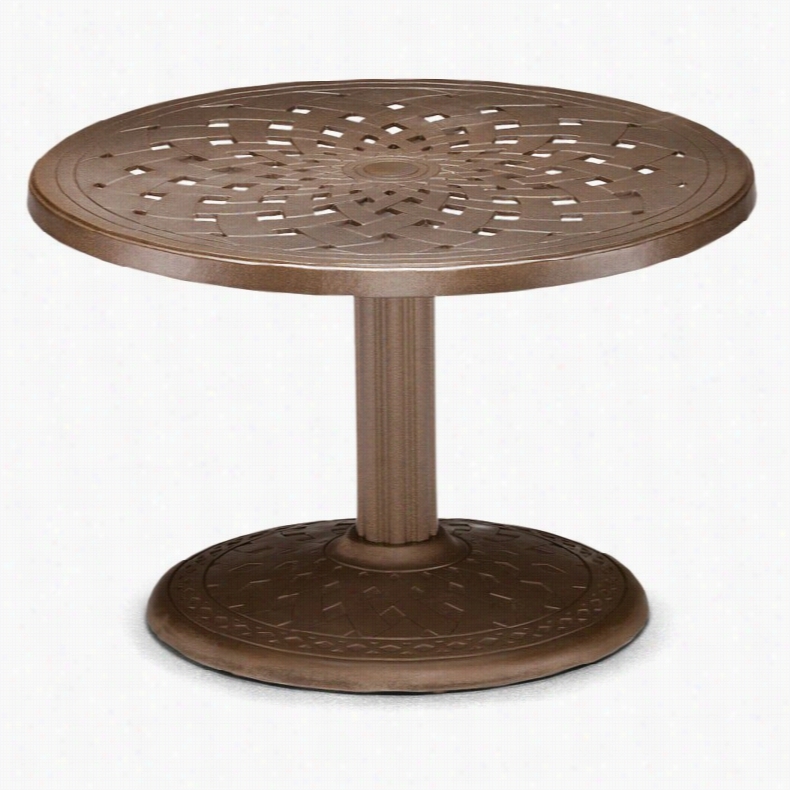 Round Cast Top Pedestal Patio Dining Table. Dimensions: 36W x 36D x 28H in.. Long-lasting cast-aluminum construction. Choose from the available finish options. Round top with decorative pattern. Integrated umbrella pedestal base. Take every meal alfresco at the comfortable Telescope Casual 36 in. 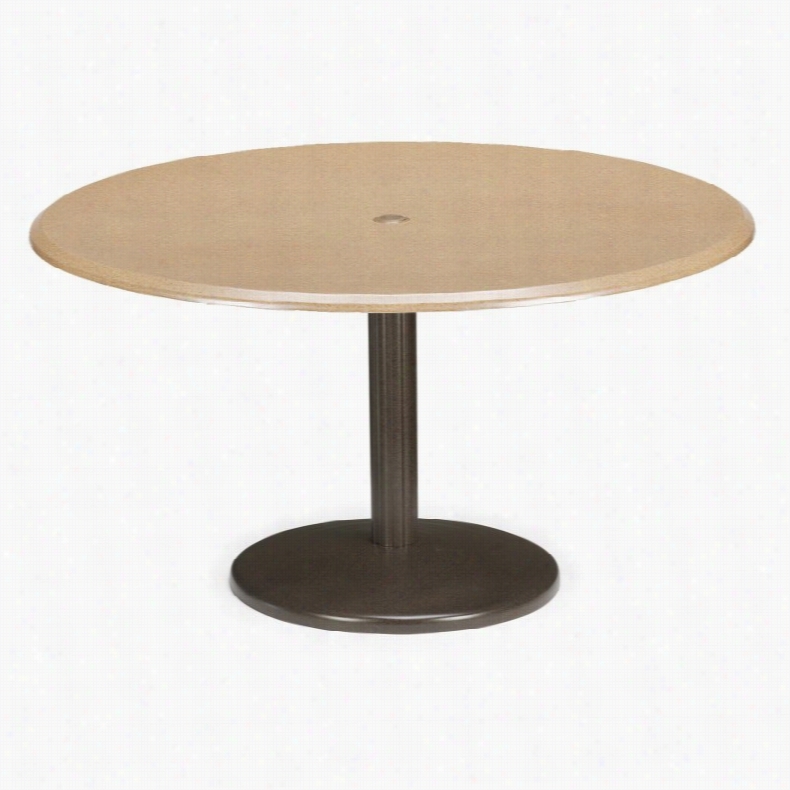 Round Cast Top Pedestal Dining Table. This inviting outdoor centerpiece features a decorative top and perfectly stable pedestal base with integrated umbrella holder for added value. Built to last, its elegant design is expertly crafted from 100% maintenance-free aluminum that will never rust, and it comes in a wide variety of exciting powder-coat finish options that won't crack or peel.Our product specialists have been individually trained by the Telescope Casual furniture company and know their product front to back, top to bottom. The most popular Fabric, finish and seating configurations are shown here, but if you don't see one that speaks to you, a product specialist will help you create the perfect set. They can also help you design a custom seating arrangement for your outdoor living space. Call 866-579-5183 to speak with a product specialist. Hours: Monday-Friday 8 a.m.-7 p.m., Saturday 9 a.m.-5:30 p.m. EST.About Telescope Casual FurnitureAfter 100 years in an industry where design differentiation is crucial for success, Telescope Casual Furniture has become known for its ability to stand out. The century-old manufacturer exceeds most retailers' expectations not only by consistently turning out unique products, but also by maintaining an unwavering stance with respect to quality. Recipient of the Casual Furniture Retailers Association Manufacturer Leadership Award, the Granville, N.Y.-based company will continue to push the envelope on already high standards for the next 100 years. Color: Textured Kona. 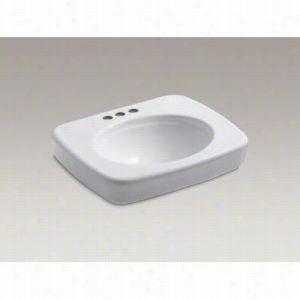 Kohler - K-2340-4-0 - 24" Single Bowl Pedestal 3-Hole 4" Centers Vitreous China Bathroom Sink Only with Overflow, Less Pedestal Base, 24" x 21. Telescope Casual 48 in. 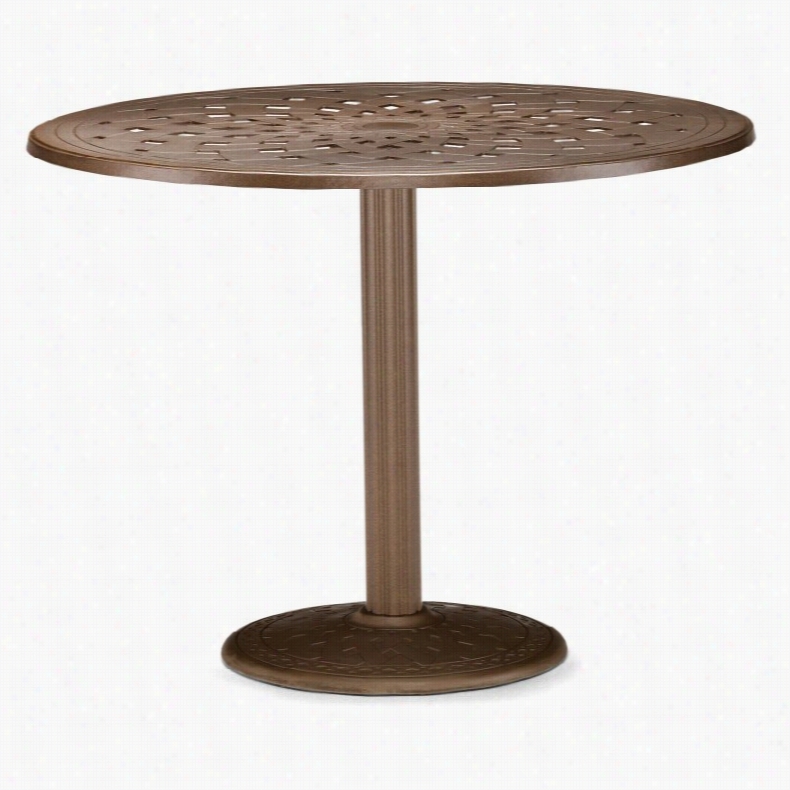 Round Werzalit Spun Pedestal Bar Height Table with Hole and Support Coriander Fiber Aged Bronze. Dimensions: 48W x 48D x 40H in.. Werzalit top and aluminum base. Choose from the available top colors and frame finish options. Round top with hole for your umbrella pole. Seats 6 comfortably. Spun Pedestal base with integrated umbrella support. Drinks are better enjoyed with friends and at the Telescope Casual 48 in. Round Werzalit Spun Pedestal Bar Height Table with Hole and Support, where you can sit comfortably with six or more of your best pals and take in the evening air as well as a few of your favorite cocktails. This handsome table with caf&eacute; appeal is wonderfully spacious, but even more incredible is its durability. While the top has the high-end polished look of genuine stone, it's actually made from Wertzalit, combining wood, resins, and melamine to produce a high-tech composite that can withstand the extremes of moisture, weather, and surface abrasion. Its stylish spun pedestal base is equally resilient, being crafted from sturdy aluminum with color that won't crack or peel. Best of all, both the top and frame are available in your choice of a variety of finish options so you can give your new table a personalized touch. Our product specialists have been individually trained by the Telescope Casual furniture company and know their product front to back, top to bottom. The most popular fabric, finish and seating configurations are shown here, but if you don't see one that speaks to you, a product specialist will help you create the perfect set. They can also help you design a custom seating arrangement for your outdoor living space. Call 866-579-5183 to speak with a product specialist. Hours: Monday-Friday 8 a.m.-7 p.m., Saturday 9 a.m.-5:30 p.m. EST.About Telescope Casual FurnitureAfter 100 years in an industry where design differentiation is crucial for success, Telescope Casual Furniture has become known for its ability to stand out. The century-old manufacturer exceeds most retailers' expectations not only by consistently turning out unique products, but also by maintaining an unwavering stance with respect to quality. Recipient of the Casual Furniture Retailers Association Manufacturer Leadership Award, the Granville, N.Y.-based company will continue to push the envelope on already high standards for the next 100 years. Color: Aged Bronze. Telescope Casual 30 in. Round Cast Aluminum Pedestal Conversation Height End Table. Dimensions: 30W x 30D x 22H in.. Long-lasting cast-aluminum construction. Choose from the available finish options. Round top with decorative pattern. Integrated umbrella pedestal base. The low-profile Telescope Casual 30 in. Round Cast Aluminum Pedestal Conversation Height End Table stands at the perfect level for a relaxing afternoon tea with friends who love to sit and chat for hours and hours. This beautifully crafted and surprisingly versatile end table features a decorative top and pedestal base with integrated umbrella holder for added value. Built to last, this handsome outdoor table is made from 100% maintenance-free aluminum that will never rust, and it comes in a wide range of powder-coat finish options that won't crack or peel.Our product specialists have been individually trained by the Telescope Casual furniture company and know their product front to back, top to bottom. The most popular fabric, finish and seating configurations are shown here, but if you don't see one that speaks to you, a product specialist will help you create the perfect set. They can also help you design a custom seating arrangement for your outdoor living space. Call 866-579-5183 to speak with a product specialist. Hours: Monday-Friday 8 a.m.-7 p.m., Saturday 9 a.m.-5:30 p.m. EST.About Telescope Casual FurnitureAfter 100 years in an industry where design differentiation is crucial for success, Telescope Casual Furniture has become known for its ability to stand out. The century-old manufacturer exceeds most retailers' expectations not only by consistently turning out unique products, but also by maintaining an unwavering stance with respect to quality. Recipient of the Casual Furniture Retailers Association Manufacturer Leadership Award, the Granville, N.Y.-based company will continue to push the envelope on already high standards for the next 100 years. Color: Aged Bronze. Haugen Customizable Roll-Top Single Right Pedestal Laptop Desk. 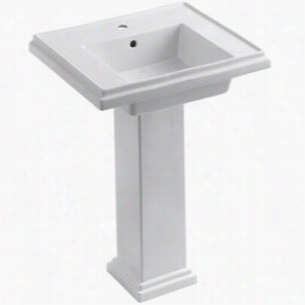 Kohler K-2844-1-0 - 24" Single Bowl Pedestal 1-Hole Fireclay Bathroom Sink with Overflow, 24" x 19 1/2" x 34 5/8. Telescope Casual 36 in. Square Werzalit Spun Pedestal Conversation Height Table with Hole and Support White Textured Harvest. Dimensions: 36W x 36D x 22H in.. Werzalit top and aluminum base. Choose from the available top colors and frame finish options. Square top with hole for your umbrella pole. Spun Pedestal base with integrated umbrella support. The classically styled Telescope Casual 36 in. Square Werzalit Spun Pedestal Conversation Height Table with Hole and Support gives your outdoor setting a charming caf&eacute; appeal. Capable of accommodating two to four people, this small-scale table is surprisingly spacious, but even more surprising is its durability. While the top has a high-end polished stone look, it's actually made from Wertzalit, combining wood, resins, and melamine to produce a high-tech composite that can withstand the extremes of moisture, weather, and surface abrasion. 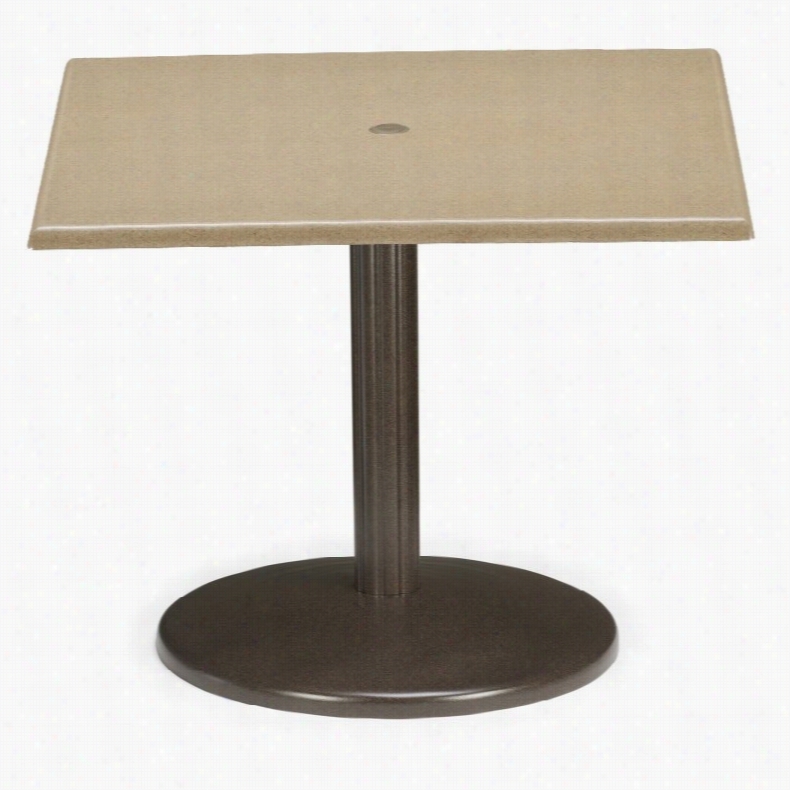 Its spun pedestal base is equally durable, being crafted from sturdy aluminum with color that won't crack or peel. Both the top and frame are available in your choice of a variety of finish options so you can give your new table a personalized touch. Our product specialists have been individually trained by the Telescope Casual furniture company and know their product front to back, top to bottom. The most popular fabric, finish and seating configurations are shown here, but if you don't see one that speaks to you, a product specialist will help you create the perfect set. They can also help you design a custom seating arrangement for your outdoor living space. Call 866-579-5183 to speak with a product specialist. Hours: Monday-Friday 8 a.m.-7 p.m., Saturday 9 a.m.-5:30 p.m. EST.About Telescope Casual FurnitureAfter 100 years in an industry where design differentiation is crucial for success, Telescope Casual Furniture has become known for its ability to stand out. The century-old manufacturer exceeds most retailers' expectations not only by consistently turning out unique products, but also by maintaining an unwavering stance with respect to quality. Recipient of the Casual Furniture Retailers Association Manufacturer Leadership Award, the Granville, N.Y.-based company will continue to push the envelope on already high standards for the next 100 years. Color: Textured Harvest.